Life is short. It has been an incredibly emotional week for me. I received terrible news that a dear friend of mine died unexpectedly over the weekend. It was sudden and terribly shocking for me and everyone that knew him. He was only 41 and left behind a wife and two twin boys. I had some photos and videos stored away that I knew his family and friends would appreciate. Digging them up wasn’t easy for me, it brought back a lot of memories, good and bad. It’s been a year since I closed the gym I ran with my husband for ten years. The gym was a community, and I thought of many of my clients as an extended family, but they all drifted away after it’s closure. Sharing our memories of Sam has reconnected us in a way and made me realize that I’ve shut myself away and closed myself off. I don’t want to take whatever time I have left for granted, I want to live my life with purpose and continue to grow and learn. Most of all, I want my family to know that they are important to me and that I love them. 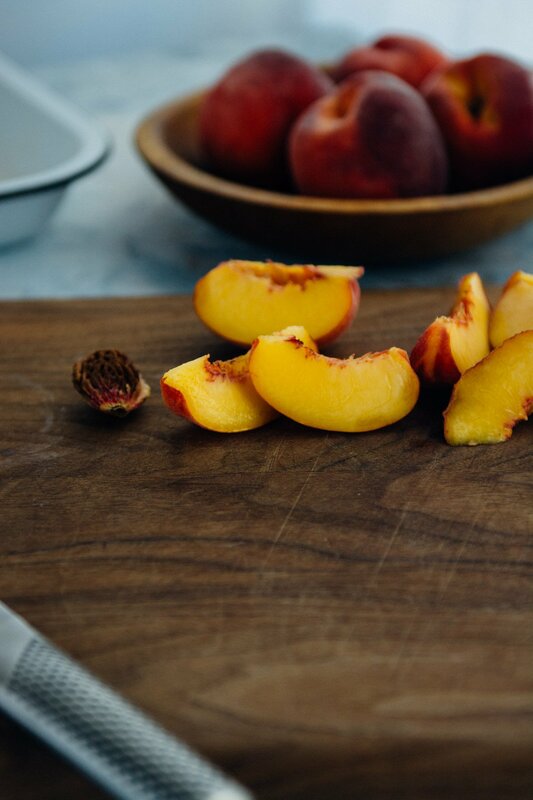 As summer winds down I always get a desperate need to use up as much seasonal fruit as possible. 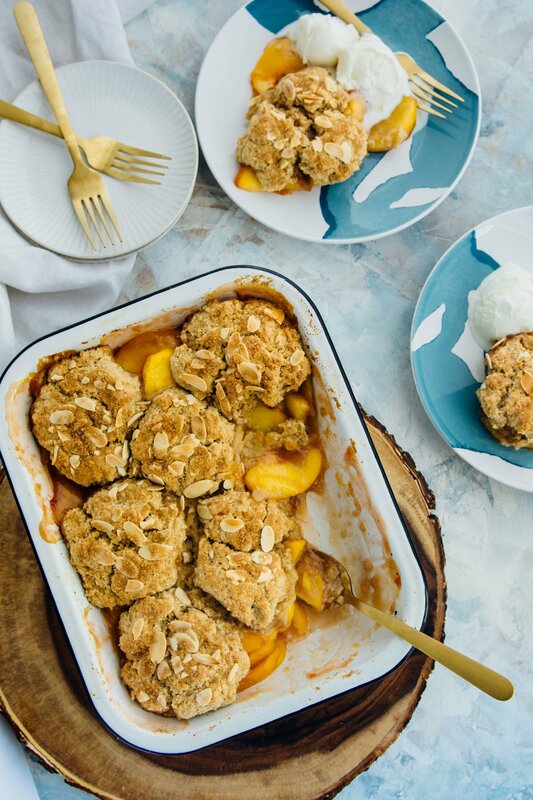 Cobblers and crisps are an easy and quick way to make a healthyish dessert that tastes wonderful and highlights the best the season has to offer. 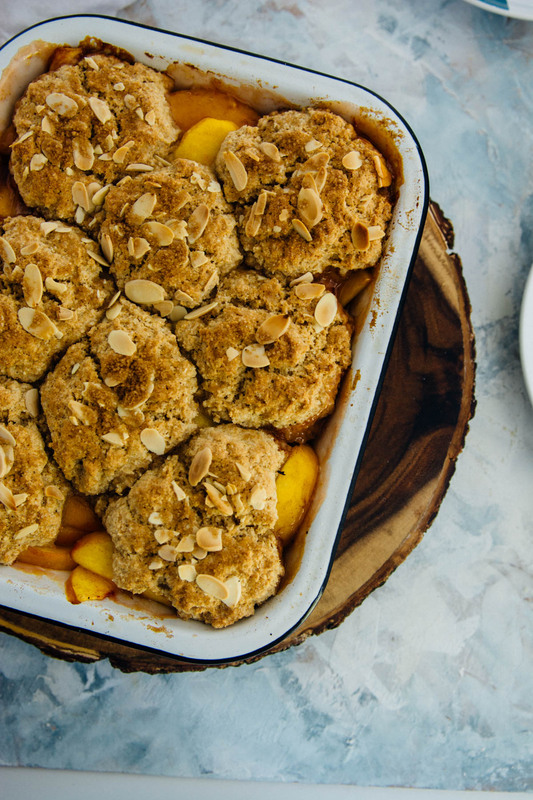 If you have room to store fruit in your freezer this cobbler will work with fresh or frozen fruit. 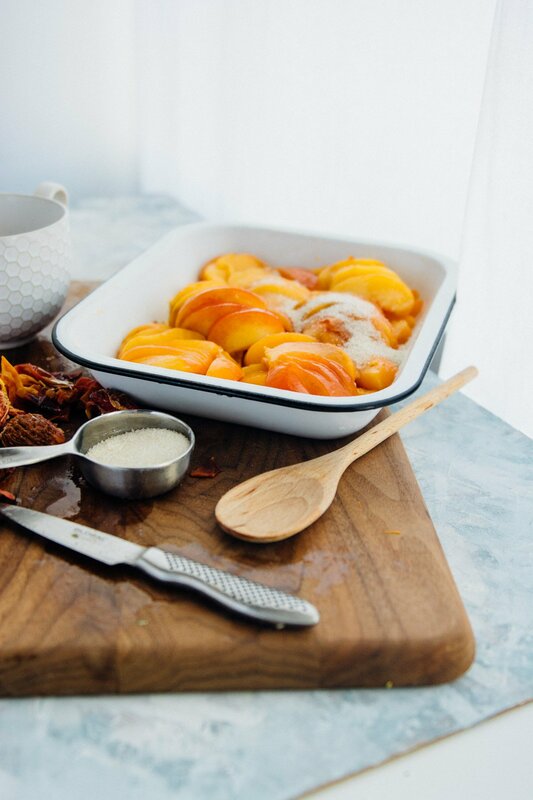 It would be lovely to enjoy this dish that screams summer in the doldrums of winter. 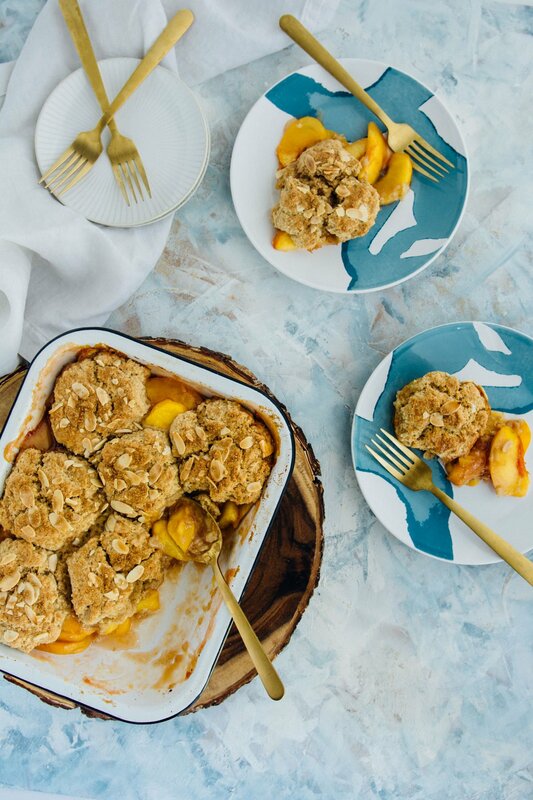 Best of all, this recipe is vegan so everyone can enjoy it! 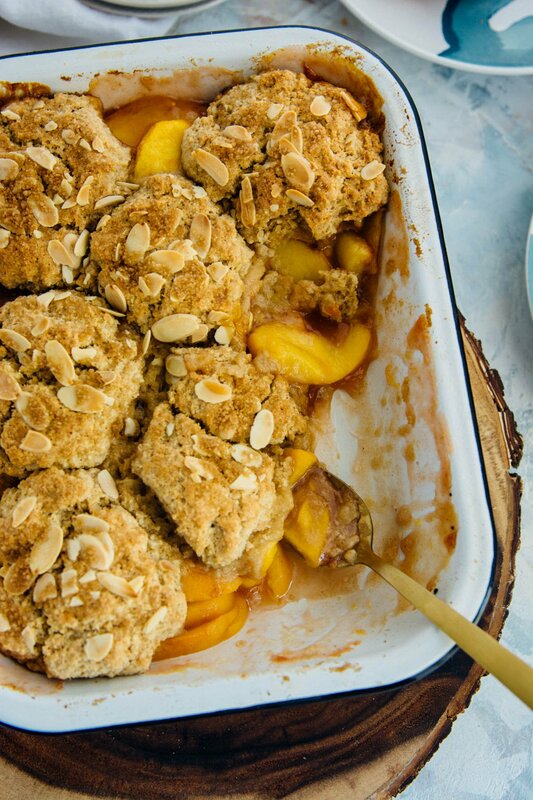 Cobblers make excellent desserts for dinner parties. 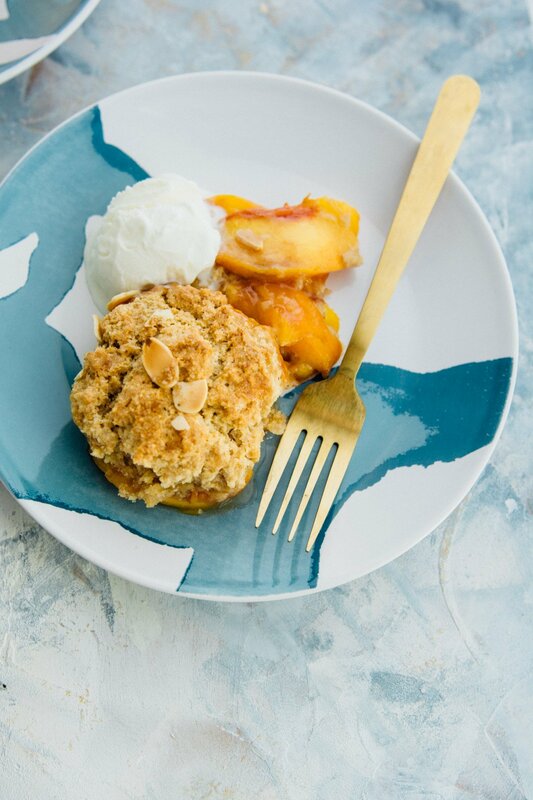 You can prepare the fruit ahead of time and the biscuit topping only takes about 5 minutes to prep, so you can pop it in the oven while you serve dinner and you’ll be rewarded with a sweet, sticky utterly delicious dessert that just screams for a huge scoop of vanilla ice cream. 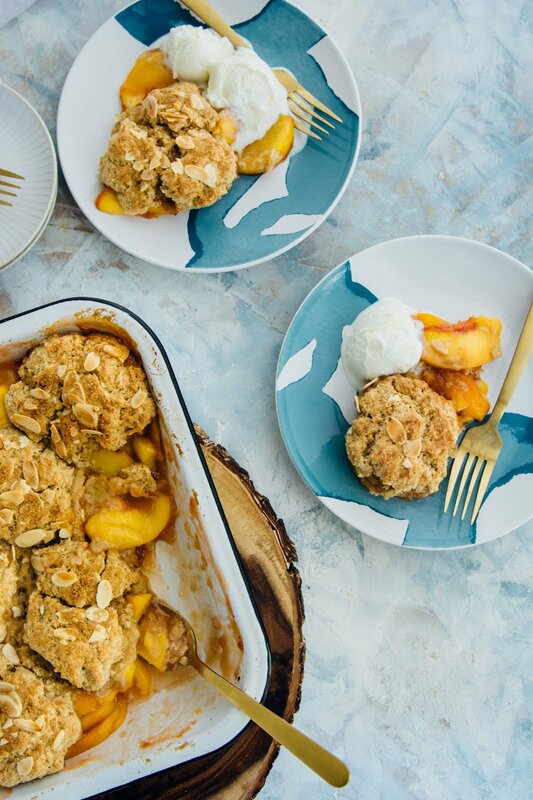 Peaches, nectarines or plums would all make great additions or substitutions in this recipe, and if you happen to find yourself with any leftovers, it reheats well. 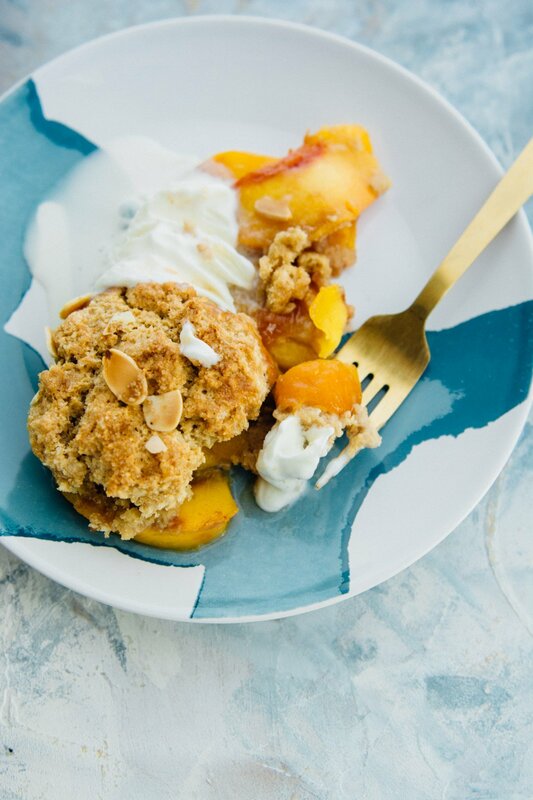 The addition of almond extract, almond flour, and sliced almonds gives the dessert a lovely flavor that pairs well with the peaches. 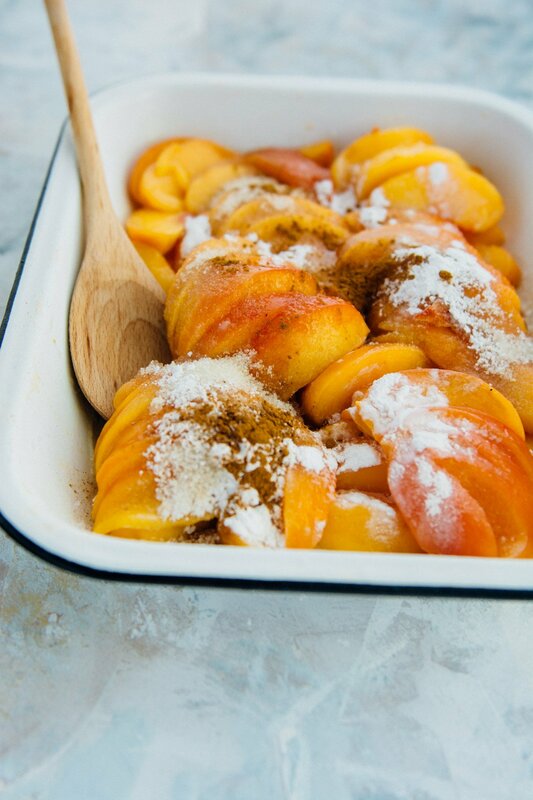 Combine the peaches, cornstarch, lemon juice, lemon zest, sugar, and cinnamon in a mixing bowl and toss until well combined. 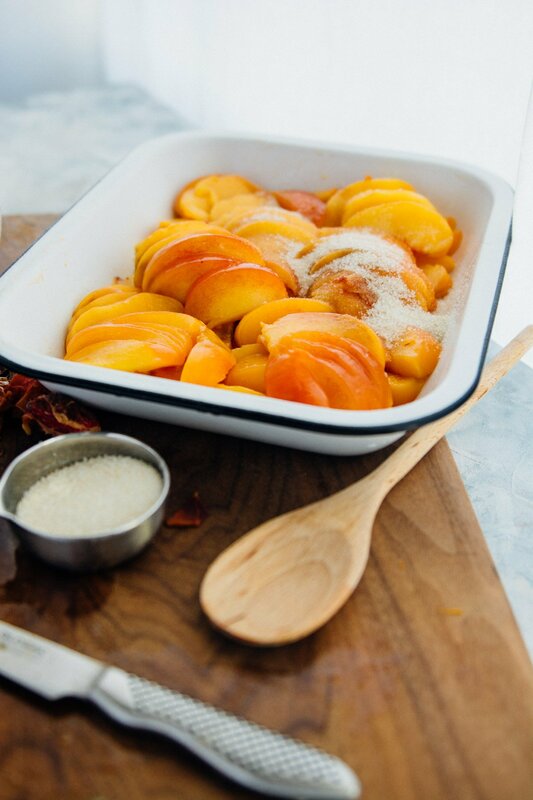 Spoon into a 9x13 baking dish and spread to fill the pan. 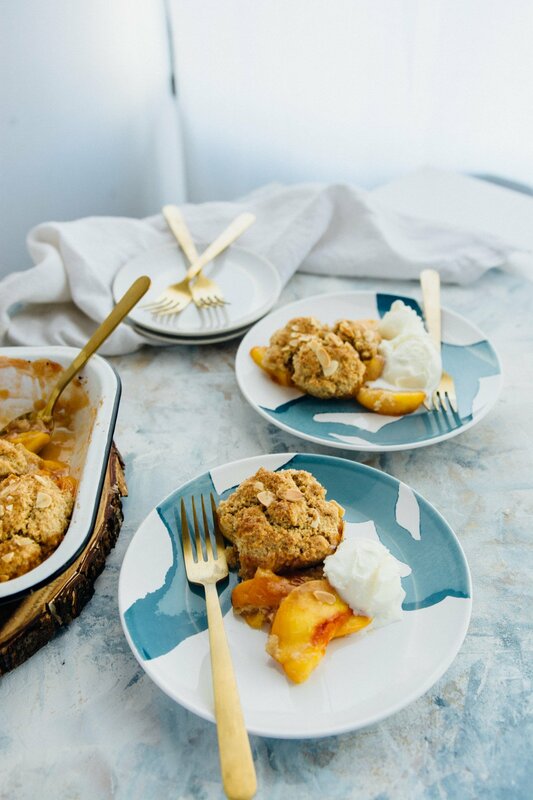 Set aside while you prepare the biscuit topping. 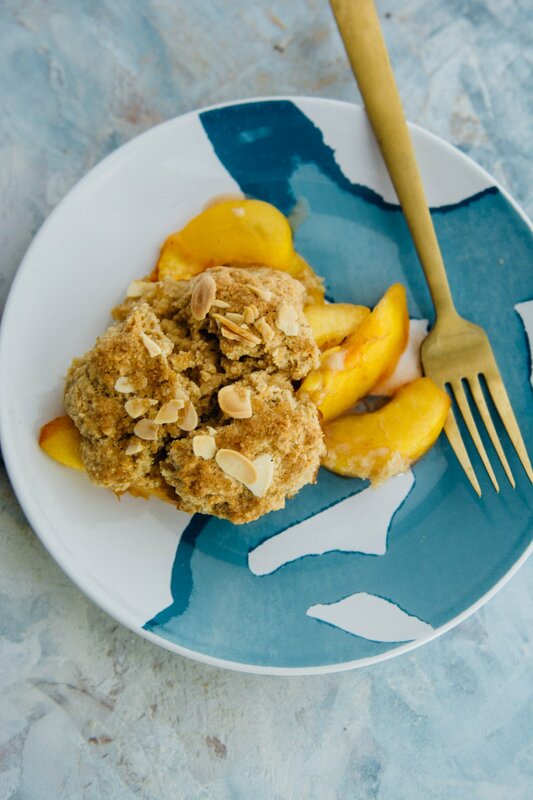 In a large bowl combine the whole wheat pastry flour, almond flour, sugar, baking powder, baking soda, and salt and whisk to combine. 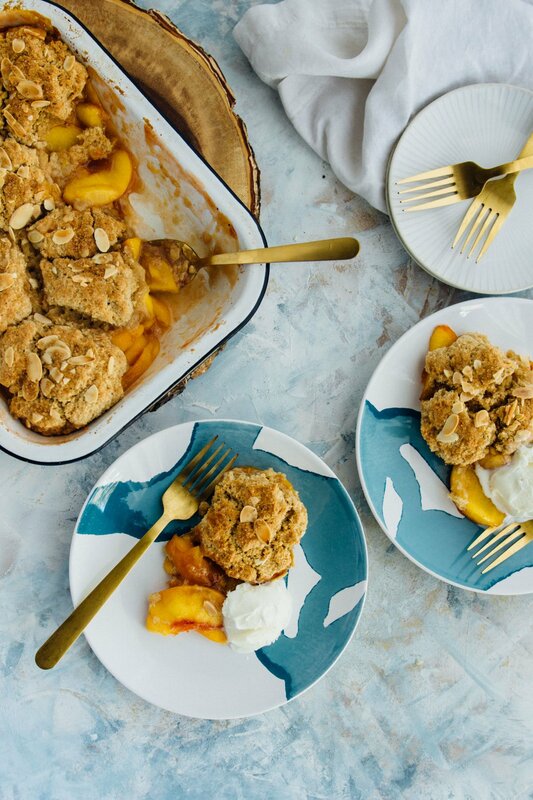 Using a pastry cutter or your fingers cut the coconut oil into the dry ingredients until evenly distributed and the mixture resembles coarse crumbs. Add the almond extract to the coconut milk, stir and then add to the flour mixture. 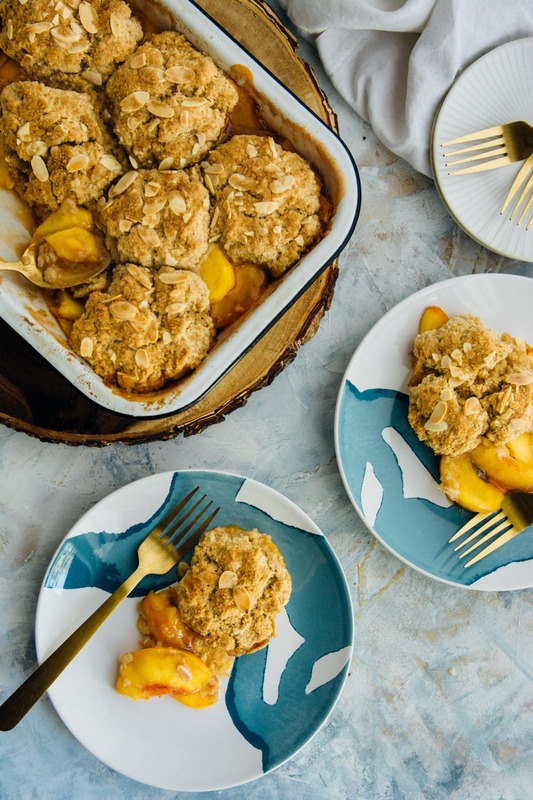 Mix until just combined, the less you handle and knead the dough the more tender your cobbler will be. Drop spoonfuls of the dough on top of the fruit mixture in a random pattern. It should be uneven and not cover the entire surface of the filling. 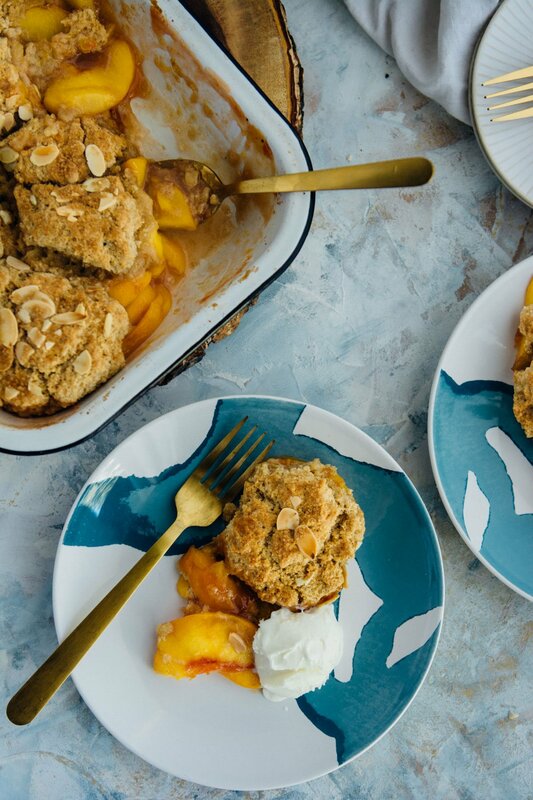 Sprinkle the turbinado sugar and almonds over the top of the biscuits.